Apartments Amarilis are modernly furnished apartments in Kaštel Novi, perfectly situated in the vicinity of the historical UNESCO protected town Trogir (8.6 km), Split airport (4 km) and the city of Split (20 km), famous for the UNESCO protected palace of the Roman emperor Diocletian. Apartments Amarilis are located in a modern apartment building which consists of 6 stylish and uniquely decorated apartments covering 3 levels - ground floor, first floor and second floor with the total capacity for up to 27 persons. Apartments Amarilis combine elegance and comfort with contemporary design and functionality, offering luxurious accommodation with all amenities needed for a nice and relaxing holiday. The nearest beach and restaurant are 1.7 km away, while the nearest grocery store is approximately 550 m away from the apartments. Apartment Amarilis 3 is located on the first floor of the building and covers 52 m2 of living area. The apartment consists of 2 bedrooms (one with double bed and one with twin beds), 1 bathroom with shower, contemporary living room with dining area and well equipped kitchen. The living area has access to a balcony overlooking the pool area. Apartment Amarilis 3 is suitable for a comfortable accommodation of 4 persons. Apartment Amarilis 3 is equipped with air condition, SAT-TV, iron and ironing board, stove, oven, hood, refrigerator with freezer, dish washer, electric kettle, coffee maker, toaster and hair dryer. Baby cot and high chair are available on request. 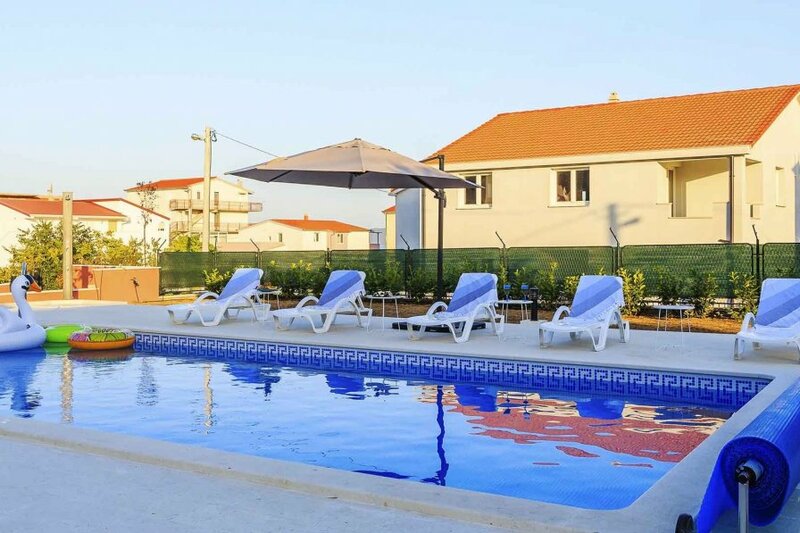 One of the highlights of apartments Amarilis is the outdoor area with a beautiful garden and the shared heated outdoor pool (50 m2) with massage tips surrounded with sun loungers and parasols, perfect for relaxing during the hot summer days. Those who enjoy cooking outdoor and dining al fresco will surely appreciate the common outdoor barbecue and large outdoor table. As an addition to the outdoor area there is also a ping pong table, as well as a play area for children equipped with trampoline, slide and a basketball hoop. Guests of apartments Amarilis have the option of arranging a breakfast from a professional catering company for additional charge (11 €/person/night). Laundry service is also available, free of charge. The property offers free open parking with 9 parking places. Enjoy your stay in apartment Amarilis 3 and spend an unforgettable holiday in Kaštel Novi!